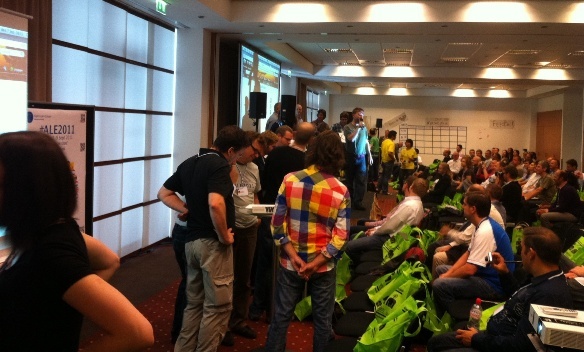 Last week I went to Berlin for the very first Agile Lean Europe conference. 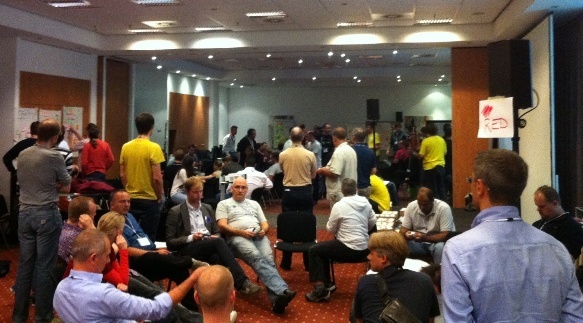 ALE2011 was one of the many ideas that originated during the World Café session hosted by Jurgen Appelo during XP2011 in Madrid. As I’m a lazy fellow, I suggest you read the history of ALE2011 in this blogpost from Olaf Lewitz, instead of me writing it down. 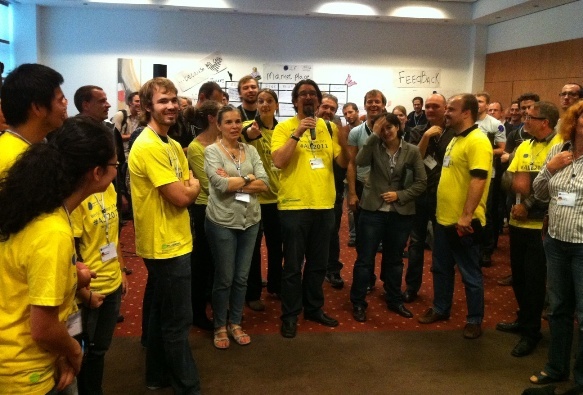 I was involved in the organisation of ALE2011 on the community sofa, and I can assure you this was a crazy adventure. Planning a conference with more than 40 organizers can be quite chaotic! But thanks to some natural leaders like Olaf & Marcin the chaos evolved into self organisation. They shared their experience of organizing it during the conference in a session. On Tuesday evening I flew to Berlin after a day of work at my client’s office. When I met the other participants in the hotel bar, I could already feel that this conference was going to be special. There was excitement in the air. Something new was going to happen! I also understood the success of eXtreme Tuesday Club, when UK agilists explained me that this was exactly the format of XTC. Having a good time together in a bar, drinking a beer and sharing stories. This is why I believe the Agile Belgium Drinkups have a good future ahead of them. On Wednesday morning, the conference officially started with a warmup session by John Jagger. He involved the entire audience in his cyber dojo, which was quite an achievement, knowing that there were more than 200 people in the room! In the afternoon Open Space, I proposed a session about healthy KPI’s, a problem I’ve been struggling with at clients. Adopting agile is fine, but do we just keep our old KPI’s? I feel that in most organisations theser are no longer suited and trigger the wrong behaviour. We experimented a little bit with using trends instead of single point measurements, but without a good feeling. On the last day, Dave Snowden reassured us during his keynote that KPI’s are not useful and should be left aside. Maybe that’s a little harsh. I’d prefer what Bjarte Bogsnes said during his keynote about Beyond Budgeting. A KPI should start from a goal and be revised constantly. I will experiment with this in detail to figure this out. The organization reserved places in several restaurants across Berlin. You sign up for a restaurant and have dinner with people you haven’t met before. This proved to be a great way to meet new people. It should be part of every conference! Friday started again with some sessions and an open space. After lunch we listened to some more lighting talks and did a conference retrospective. Ken Power did a great job facilitating. I was quite honored that he used one of the exercises of my blog, called retrospective starfish. The event was closed by a keynote from Dave Snowden and a thanks to all organizers. In the evening I flew home with Yves Hanoulle, who made the trip much more enjoyable by being quite the storyteller. I didn’t get to see much of the city, because I didn’t want to miss a second of the conference. 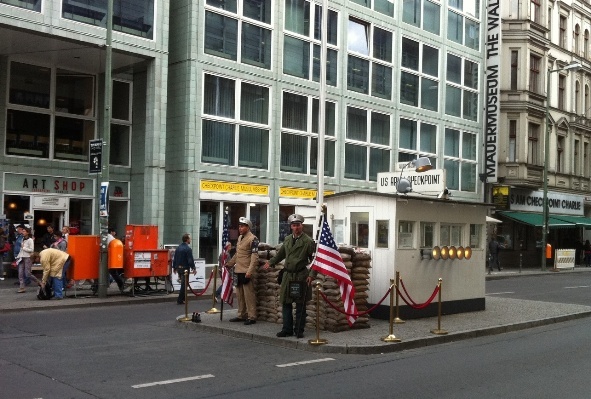 Here’s a picture of ‘Checkpoint Charlie’, the one place I visited in Berlin. 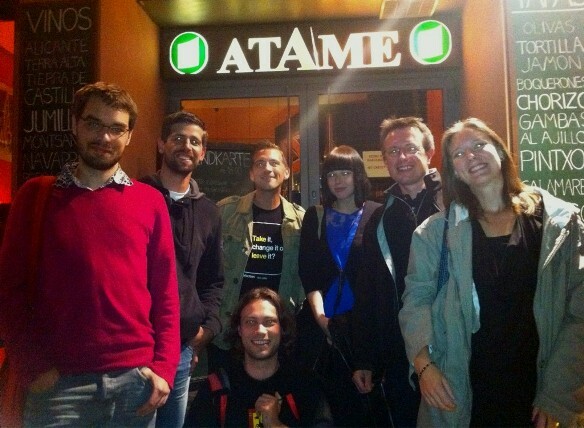 The ALE conference had a great first edition. I’m looking forward to next year. Who knows, maybe it will be held in Brussels!